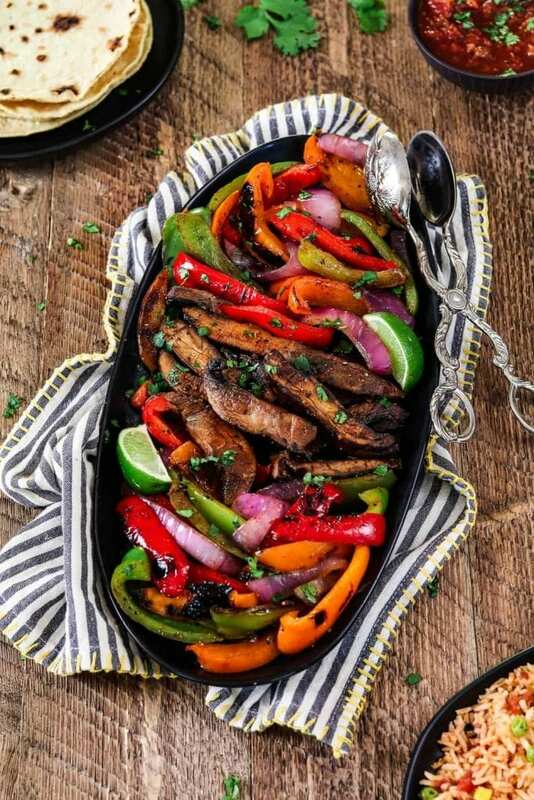 Get your weeknight sizzling In just 30 minutes with these Portobello Vegan Fajitas. They are spicy, smoky, and robust! 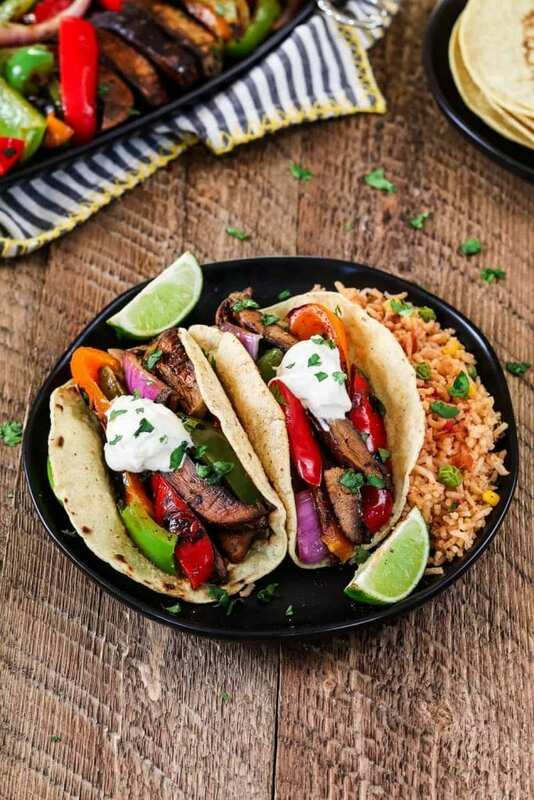 The flavors come together when the seared veggies meet the homemade fajita sauce. It’s mouth-watering good! Ahhh, that sizzling sound, don’t you just love it? Especially, when you’re dining out and hear those noisy Vegan Fajitas coming your way. They really do make an entrance, that’s for sure! Fajitas are always a great choice because they are customizable, fun to eat and perfect for sharing. They are served with an array of toppings to please everyone’s palate. I load them up! Fajitas may seem complicated to make at home, but they are ridiculously easy. They are a top family favorite along with my Vegan Pineapple Fried Rice and Vegan Mac n Cheese. You don’t really need a sauce for flavorful fajitas, BUT this sauce takes things to another level. It adds an EXTRA layer of flavor and has the perfect balance of smokiness, spiciness, and tang. You’ve gotta try it! The robust and smoky flavor comes from the chipotle peppers in adobo sauce. I use them to amp up so many recipes. Buy a few cans and keep them in your pantry. You won’t regret it! Now just blend everything up and get those fajitas ready for greatness! *Note: if you think the sauce might be too spicy for your taste, you can omit it altogether. Instead, add the dry spices (garlic powder, cumin, chili powder) when the cooked mushrooms go into the pan of sauteéd onions and peppers. You can add 1/2 teaspoon of smoked paprika too. Add a squeeze of lime juice when everything is done. Grapeseed Oil, Portobello Mushrooms, Bell Peppers, Red Onion, Salt and Pepper. Blend up the fajita sauce and set aside. Sauté the mushrooms until perfectly browned and set aside. In the same pan, sauté the onions and peppers until slightly tender and somewhat charred. Add the sauce and cook for a few minutes to incorporate flavors. Serve with warm corn tortillas, lime wedges, fresh-cut cilantro, vegan sour cream, guacamole, and rice. They are pretty spicy, but if you want to turn up the heat, add your favorite hot sauce or salsa. – The key to flavorful veggies is perfectly browning and caramelizing them. Make sure your heat is high enough and don’t add them to the pan until it’s hot. You should hear that familiar sizzle right away! – Don’t overcrowd the pan when sauteéing the mushrooms or they will steam instead of searing and browning. They need lots of room, so you may need to cook the portobellos in two batches. – To clean mushrooms, use a dry, slightly damp paper towel or a soft brush to clean each mushroom. Mushrooms are like sponges and will absorb a lot of water which can make the mushrooms soggy. – The brown gills on the mushrooms can be gently scraped if desired. They make the vegetable mixture a little darker, but it doesn’t affect the taste. I usually leave them intact. 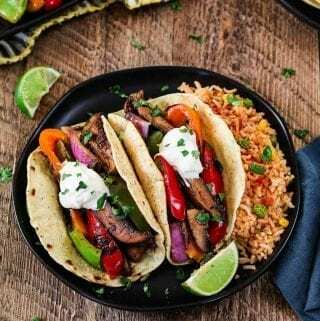 If you make these Vegan Fajitas, let me know what you think by ★ star rating it and leaving a comment below. It would really make my day. You can also follow me on Instagram and share your creation with me. Just tag me @veganhuggs and hashtag #veganhuggs so I don’t miss it. 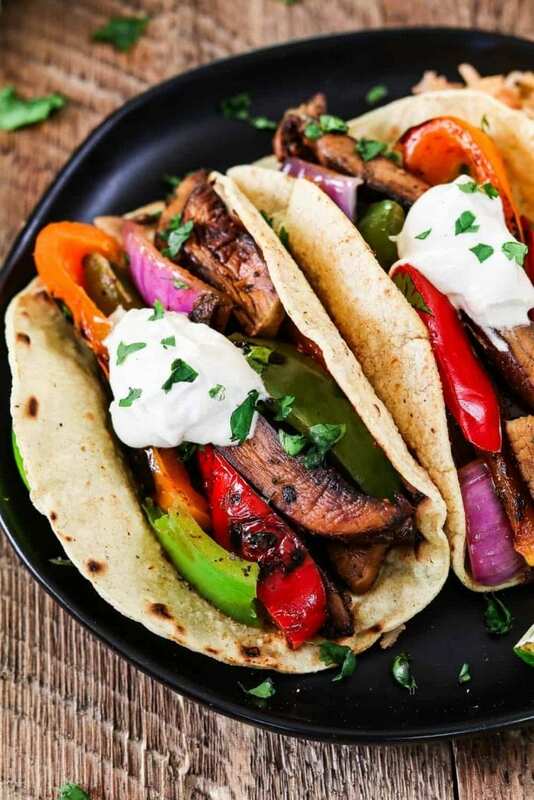 Get your weeknight sizzling In just 30 minutes with these Portobello Vegan Fajitas. They are spicy, smoky, subtly sweet and robust! 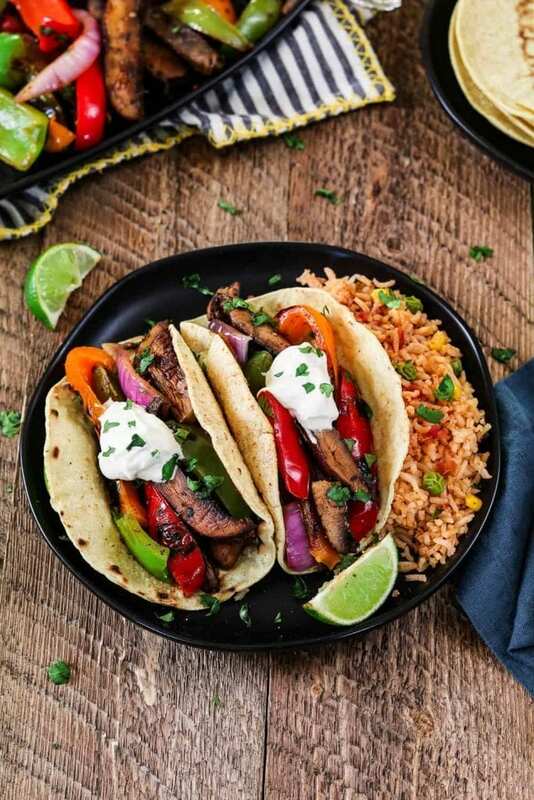 The flavors come together when the seared veggies meet the homemade fajita sauce. It's mouth-watering good! Heat a large pan over medium-high heat (*see note). When it's very hot, add 1-2 tablespoons of oil. As soon as the oil gets hot and shimmery, add the mushrooms (you should hear a sizzle). Don't move the mushrooms around the first 2-3 minutes. This will give them time to sear and brown on one side. Now give them a stir and let them brown for another 2-3 minutes. Once they have reduced their size and are fully browned, sprinkle with a generous pinch of salt & pepper. (*optional: to deglaze, splash some sherry into the pan - this will pick up some brown bits and add more flavor to your mushrooms). Remove from heat and place mushrooms on a plate or bowl. Now add the cooked mushrooms and fajita sauce. You'll want to stir frequently at this point to prevent burning the sauce. Taste for seasoning and add if needed. Cook for 1-2 minutes and remove from heat. Serve immediately. * Cleaning Mushrooms: Use a dry, slightly damp paper towel or a soft brush to clean each mushroom. Mushrooms are like sponges and will absorb a lot of water which can make the mushrooms soggy. * The brown gills can be gently scraped if desired. They make the vegetable mixture a little darker, but it doesn't affect the taste. I usually leave them intact. *Sauteéing Mushrooms: don't overcrowd the pan when sauteéing the mushrooms or they will steam instead of searing. They need lots of room. You may need to cook the portobellos in two batches. *Warming Tortillas: Place a tortilla in a cast iron or stainless steel skillet over medium heat (don’t add oil). Cook for 30 seconds on each side. Remove and cover with a slightly damp dish towel to keep soft & warm. Repeat with remaining tortillas. *Start this step before the fajitas are finished so everything will be nice and hot. *Quicker option: You can cook the mushrooms at the same time as the onions and peppers, just use 2 separate pans. I love this recipe!!! I included it in a roundup of April produce, if you’d like to check it out & share it! 🙂 I love your blog! Why would you advertise this as vegan and then have sour cream in the picture? It’s vegan sour cream and I clearly stated that in the post and recipe. Thank you. I love this fajitas recipe. I didn’t know you could make them so flavorful! 2 Thumbs up!